UniPrint solution with Uniprint Gateway exist of three components. The first component is the so called UniPrint Spool server. This server receives the files from the Terminal Server servers and sends them to the printer server. The software needs Internet Information Server with FTP enabled and several other components like MDAC, Scripting Host and others. All components are standard available in Windows 2003, but in lower version UniPrint will install them automatically. The installation of the Uniprint Spool Server software is straight forward. After accepting the license agreement you need to specify the installation directory and the FTP Site directory. Uniprint advises to install this component on a separate server. A big applause for Uniprint to make their software Cluster aware, so you can set it up in a fault tolerant environment. The second component is the Uniprint Print Server. This component need to be installed on the Windows print server. This component renders the print jobs and direct them to the actual print queue. For the installation you need a UniPrintGateway.ini, which is rendered during the Spool Server installation (white the INI file all settings concerning the Spool Server are automatically filled in). The installation is also simple. After accepting the license agreement you need to specify installation folder, the spool folder for UniPrint and the ini file. After checking the Spool Server settings the program will be installed. Also this component can be installed on a clustered servers. The third (and additional fourth component) need to be installed on the Terminal Server server(s). The third component UniPrint Plus installs the Uniprint universal driver and imports the printers from the other Uniprint components. 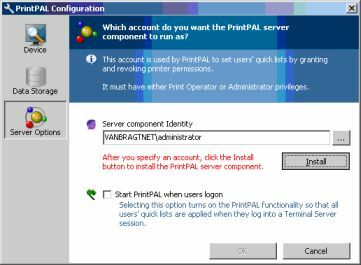 During the installation wizard you need to specify which components you use (only Uniprint or also the Uniprint Gateway). 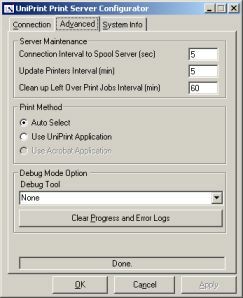 Then (out of the INI file) the Uniprint Spool Server settings are displayed and can be altered if necessary, followed by choosing the wanted security mechanism (none, NT or ADS). After the installation the PrintPAL setup is started automatically. PrintPAL can be used to link Printer to machines or machine groups. In this way users get the nearest printer(s) by the machine they are currently working on. During the PrintPAL installation three parts need to be filled in. The device part you specify which components PrintPAL may use to discover machines for configuration (Basic Networking, Directory Service and/or Terminal Services), where the data of PrintPAL need to be stored (File Share) and an service account. UniPrint point in their manual to the silent installation possibilities for the UniPrint Spooler Server and the UniPrint Print Server. We can not found this for the UniPrint Plus on the Terminal Server. We think that this component definitely also needs an unattended option. All three components have their own configuration possibilities. We first start with the UniPrint Printer Server, this component arranges that the PDF file will be converted in a normal print job and sends that Job to the printer(queue). The configuration tools exists of three tabs. On the first tab the Spool Server(s) are listed with their settings. Also a button exists to update the printer to the Spool Server manually. 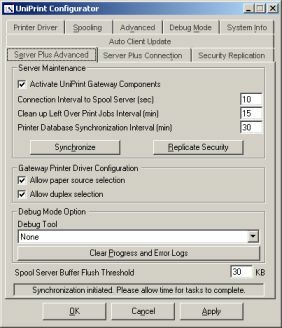 The second tab called advanced makes it possible to change real settings like the connection interval to the Spooler Server(s), which program needs to be used to convert the print jobs (Acrobat Reader or the UniPrint application), in which time the spool needs to cleaned and in which interval update the printers to the Spool Servers. Wonderful option, in this way just adding a printer(queue) automatically arranges that the printer is available in UniPrint. As described UniPrint Print Server automatically updates the UniPrint Spooler server with new printers or changed printers. So actually nothing need to be changed or configured on the Spooler Server. The tool shows all printers (from the Printer server) en if needed some little changes van be made like DPI settings, paper size and something like that. Happily you can set the most important setting (paper size) via global modifications for all printers. Al last the two tools which are installed on the Terminal Servers. First the Uniprint Configurator, with this tool we can adjust all kind of settings concerning printer settings and communication with the Spooler Server(s). On the Printers tab all setting concerning the printer properties can be arranged like paper size, dpi quality, duplex, paper source, spooling and so on. Also settings concerning the connection with the Spooler Server can be set here. Also here the interval can be specified with synchronizing with the Printer Spooler. If you are not using the Spooler Service, but just the Uniprint Server on the Terminal Server you can also configure to update the client automatically. The second tool PrintPAL can be used to link printers to a machine. If the user logs on the Terminal Server automatically connects the printer(s) configured in PrintPAL for the user logged on. You can search the complete network environment for machines. After creating a group the machines can be join the group. The last step is to assign the necessary printers to the group and saving the configuration. It would be nice if there is a feature available that the settings can be replicated to other servers which have the same functionality. Only in PrintPAL uses (as far we can see) a shared database. Although it less important for the other configuration settings, it would be nice if you does not have that do for each server. Where Uniprint did a good job is the possibility to load balance the Spooler Servers. Although we did not test this functionality it looks pretty good. Every component is equipped with three additional tools for troubleshooting and management. On every server the following tools are available Database Manager (for checking the database entries and errors for the selected component), Connection Validator (for testing the connections and transfering files) and Object Reference viewer (to troubleshoot and check the status of several parts). Also all components have some log files which can be used to troubleshoot and Print Server en Print Configurator have both a debug option. A user will normally not notice lots of Uniprint, the user is happy if the printed document will be printer in a fine quality and out of the right printer (near their desk). With Uniprint there will less printing problems, so your users will be satisfied. If you used PrintPAL they automatically get the printer(s) in the surrounding of the computer they are working on at the moment. User will love that option especially if they work at several locations. Although UniPrint has less options than ThinPrint it offers a good solution for the most situations supporting auto client printing and a dedicated printer server in combination with a universal printer drive. All components work fine together with less configuration after the first setup, because of the replication technology between the two products. We really like that UniPrint makes is possible to install the software on cluster servers and the option to load balance the Spooler Servers. Also the trouble shooting possibilities are adequate. We would love to see to optio to share the configuration settings of Uniprint Configurator, Spooler Server and Print Server just like PrintPAL can.